Read the following tips on Florida’s plan for the best health care insurance. This guide plan is designed to assist you in searching for the most affordable health care insurance coverage in Florida—regardless of your situation. 1. Take the free money. If your employer provides a plan for health insurance which offers to pay a few or all the premium for you, then you can opt to take the free money. Bear in mind that most employers don’t offer their willingness to pay the premium portion for your children and spouse. Therefore, if you have a family, then you can save more money by searching for individual health insurance for them, then you can choose the group health plan. Individual health insurance has a lower rate than group health insurance because of the differences in the treatment of the pre-existing conditions. 2. Review your health insurance policy every year. Over time, your insurance requirements will change and it’s best to have re-assessment of your goal and modify your benefits and plan for that reason. Once again, the advantage of working with independent agent versus a captive agent is evident: you’ll be able to get professional advice yearly then make comparisons on quotes from top insurers as opposed to the current yearly health plan. 3. Turn to a licensed insurance agent and not to a captive insurance agent. Working with a captive insurance agent means dealing with a single insurance company only. Therefore, this can eliminate the opportunities to shop for different policies. Also, this will help you compare insurance policies from various companies. Captive agents can seldom serve the best interest of clients because their purpose is to sell the items from their company—whether it fits the client or not. There are no other options except for the product line of their company. Don’t get deceived if the insurance agents tell you that they work with different companies but can only show a quote from a single company. It is but best to work with an agent who can guide you through by providing many Florida health insurance quotes from various insurance providers. 4. Admit the truth if you committed a mistake. It’s a great lesson to learn if you were forced by an agent to get health insurance despite the fact that you don’t understand completely how the policy works to your advantage. With that, start working with an experienced and independent agent. It’s an alarming sign if the name of the insurance company has never been heard before. Bear in mind that if you want to go for a reliable insurance company, preferably that company should have national coverage. 5. Make a careful research, cutting down on time. Remember that shopping for Florida health insurance is not fun because it’s a longer process of making research before getting the best quotes. It pays to find some of the best quotes and compare them with each other. 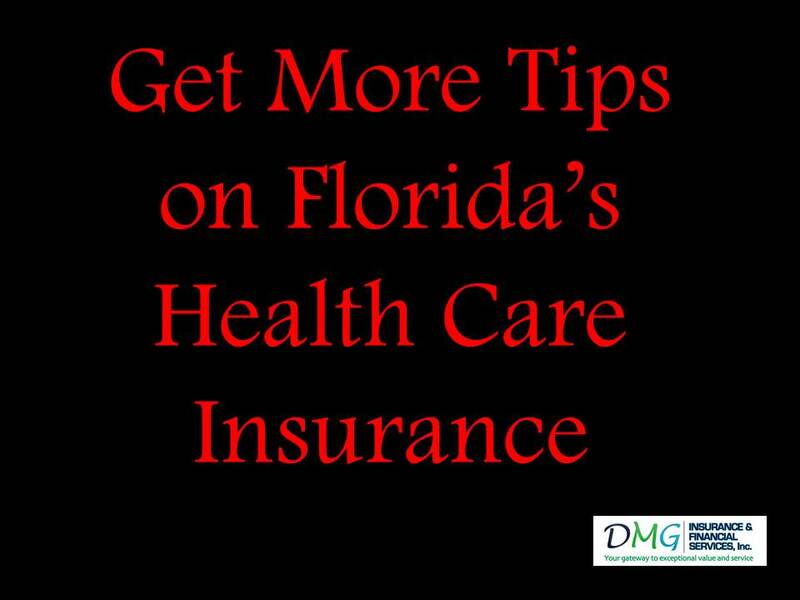 To get more information about Health Care Insurance tips in Florida, please contact us at DMG Insurance and Financial Services, Inc. (http://www.dmginsurance.com) at 543 N State Road 7, STE 106, Royal Palm Beach EL, 33411, phone 561 422 7071, Fax 561 422 7072.